The suite of instructor's resources, including LaunchPad, support both Berger's Childhood & Adolescence 11e and Childhood 8e. Edition after edition, Kathleen Stassen Berger’s bestselling textbooks connect students to the field of developmental psychology, in an engaging, accessible, culturally inclusive way. Berger’s Invitation to the Life Span does this in just 15 concise chapters and an epilogue, in a presentation that meets the challenges of exploring the breadth of the life span in a single term. 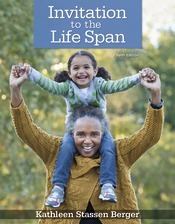 The new edition of Invitation to the Life Span incorporates a wide range of new research, especially in fast-moving areas such as brain development and psychopathology, while taking advantage of innovative new tools for media-centered teaching and learning. But throughout, as always, the signature voice of Kathleen Berger ties it all together, with relatable explanations of scientific content, wide ranging cultural examples, and skill-building tools for sharper observation and critical thinking.